Who Wants to be a Self-driving Car? is a data driven trust exercise that uses augmented reality to help people empathize with self-driving vehicle systems. 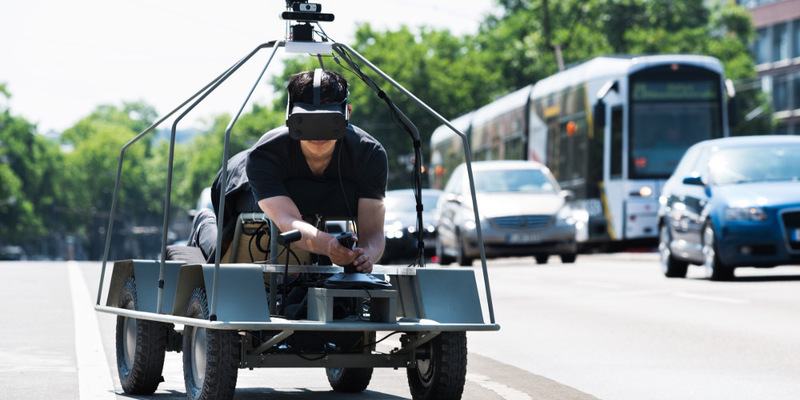 We built an unconventional driving machine that lets people use real-time, three-dimensional mapping and object recognition, displayed in a virtual reality headset to navigate through space. Discussions around the future of mobility are currently focused, among others, on the possible large-scale changes posed by self-driving cars. Of particular interest are the questions rising around the many ways life is increasingly being affected by artificial intelligence and how we can learn to interact and understand these systems. In most cases, these challenges and questions are being addressed behind closed doors and in domain-specific contexts and are often inaccessible to the wider public. Our goal is to bring people closer to these discussions by experimenting with new, immersive media experiences and interactive prototypes. What happens when people are able to empathize with self-driving cars? What might we discover when people are forced to “see the world” through sensors and make decisions based on data, probabilities, and statistics? And how can we use new technologies like VR to better reach audiences who might not typically engage with these topics? Joey Lee (US) is a practicing interaction designer and creative technologist, formally trained as a researcher in Geography (BA, MSc), specifically in experimental methods for mapping and monitoring urban environments. Benedikt Groß (DE) is a speculative and computational designer who works antidisciplinarily. He holds an MA in Design Interactions from the Royal College of Art. Raphael Reimann (DE) is a multi-disciplinary urbanist. He quickly found the intersection of fast-paced digital services and persistent city infrastructure as an extremely interesting and challenging field. As part of moovel lab, they work in a creative environment collaborating with different people. moovel lab is all about exploring ideas and technologies related to what moves us in our urban surroundings. MESO Digital Interiors is a Frankfurt-based design studio creating digital systems for communicative spaces. Sebastian Oschatz, Theron Burger, Johannes Lemke, Sebastian Kujas, Timon Skerutsch, and Urs Hofmann formed the MESO team. David Leonard is a journalist, artist, video director, writer, technologist, and educator based in Los Angeles.